Okaaay, let's just call that the most confusing encounter I've ever had in my life, and talk about something else. Hey, look! Exposition regarding temporal mechanics! How very humourous and exciting! Yay! Certainly not just filler caused by lack of decent writing at present! Nope! Okay, I got two comics done in the week. That's not too bad, right? Especially since I need to modify old pages too! On another note, when I was editing the past page for today, iTunes started playing "The Big Boom". Yay for coincidentally appropriate music. @Kimundi: Sorry, I fail to understand. What exactly do you mean? It makes me glad that I finished my archieve binge before you started making changes. "Well, there's no turning back now." "This is going to be the best Christmas Wilfred has ever had." Jane: Why exactly is this such a problem? We can just jump back, knock me on the noggin and shoot me into the present, no? 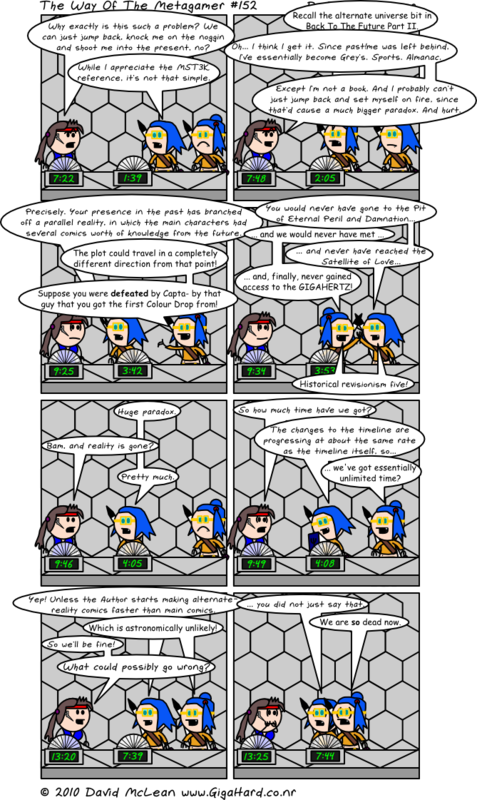 Trope-tan: While I appreciate the MST3K reference, it's not that simple. past!Trope-tan: Recall the alternate universe bit in Back To The Future Part II. Jane: Oh... I think I get it. Since past!me was left behind, I've essentially become Grey's. Sports. Almanac. Except I'm not a book. And I probably can't just jump back and set myself on fire, since that'd cause a much bigger paradox. And hurt. Trope-tan: Precisely. Your presence in the past has branched off a parallel reality, in which the main characters had several comics worth of knowledge from the future. past!Trope-tan: The plot could travel in a completely different direction from that point! Suppose you were *defeated* by Capta- by that guy that you got the first Colour Drop from! past!Trope-tan: ... and, finally, never gained access to the GIGAHERTZ! Jane: Bam, and reality is gone? Jane: So how much time have we got? past!Trope-tan: ... we've got essentially unlimited time? Trope-tan: Yep! Unless the Author starts making alternate-reality comics faster than main comics. past!Trope-tan: Which is astronomically unlikely! Jane: So we'll be fine! Trope-tan: ... you did not just say that. past!Trope-tan: We are *so* dead now.